We Heart Family and Friends is really excited to be sharing this giveaway with all of you. This is the very first post for my new site and so yes, this is something that Im excited about as well. I want to wish you all good luck. If you win, please let me know, as I enjoy hearing when one of my own readers win. If you’re one of those try to “do all, be all” parents (who isn’t?) then Kinsights is definitely for you! Kinsights is a great online resource for parents. You can ask questions of parents who have been in your shoes before, share your experiences with others, and track your children’s heatlh history. You have nothing to lose by trying out Kinsights! I really cannot recommend it enough! 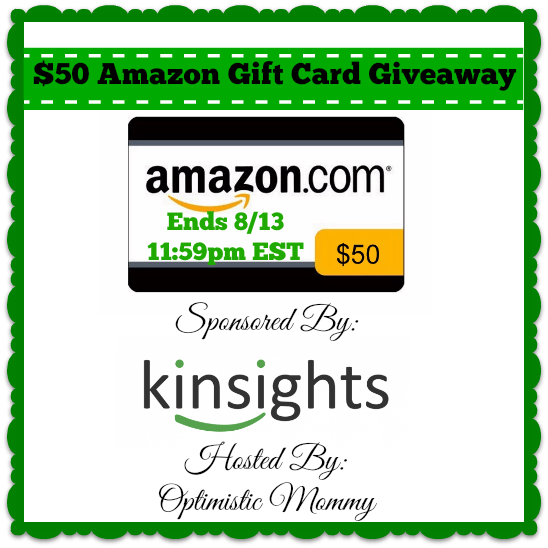 They have been kind enough to sponsor a $50 Amazon gift card giveaway! This giveaway runs now to August 13th at 11:59pm EST. Good luck to all who enter! We Heart Family and Friends is not responsible for prize shipment. Facebook, nor any other social media site is responsible for this giveaway. They are released from any and all liabilities that may arise. They are not sponsoring or endorsing this giveaway. I would use the gift card to buy books for my little one. And I like that on Kinsights I am able to connect with other parents for guidance, advice and ideas with our kiddos.